Please enter more than 2 characters. Buying a boat is an exciting time in your life, but it can also be daunting. Multihull Solutions is here to ensure your buying experience is smooth sailing and the best experience possible. Register & let us find your dream boat: Complete our online registration form so we can help you find the perfect boat to suit your requirements. We have access to hundreds of multihulls all over the world, not just the boats listed on our website. We will assign you a Sales Consultant who will contact you to discuss your requirements further, and we will also keep your details on file and contact you directly should we list a boat in the future that meets your search criteria. Once you have spoken to your Sales Consultant and covered all your queries, ask for an inspection so you can experience the boat in person. All our listing photos are taken at the time of the boat being presented for sale, however photos rarely do a boat justice. You need to be able to touch and feel. Make an offer subject to viewing: It is recommended that you make an offer before arranging a viewing as you don’t want to go to the expense of traveling to view the boat only to find it sold on your way there, or that your offer price would never have been accepted. Making an offer: This involves making a fully-refundable Offer Deposit Payment. Should the Seller agree to your offer, this Offer Deposit Payment will hold the boat while you make the necessary travel arrangements to view the boat. Refundable Offer Deposit: The Refundable Offer Deposit will be refundable should you find the boat does not meet the standards to which it was promoted or presented to you, or if you decide not to go ahead with the purchase for any reason during the inspection. How to make an offer: Make an offer online here. This process will also require you to provide a copy of your Driver Licence (Australian Resident) or Passport (Overseas Resident). Book your viewing: Your Sales Consultant will handle all the logistics and make sure the date and time booked for your viewing suits you, the Seller and the Sales Consultant. You’ve viewed the boat and wish to proceed subject to various conditions. A Standard Purchase Agreement will be drawn up and must be signed by the Buyer and the Seller. Both the Buyer and the Seller can choose to include their own conditions in the Standard Purchase Agreement however, as a minimum a sale is usually conditional to the outcome of the survey. Other conditions may include finance, sale of another boat or property or an item being replaced or fixed. At this point a 10% refundable deposit (less the Offer Deposit already paid) will be payable within 3 days of signing the Purchase Agreement, to secure the vessel at the agreed price. All funds are safely held in dedicated holding accounts which we offer in various currencies according to the Code of Practice. Survey: You need to engage a surveyor of your choice to survey the vessel, this ensures you receive independent advice on the condition of the vessel and any potential but unlikely issues that may present themselves. For ethical reasons we cannot choose a Surveyor for you, but we can provide a list of Surveyors to choose from. Click the following links for help locating a marine surveyor in: Australia, New Zealand, Australasia, Worldwide. Or click here to view a list of Surveyors in our various Sales Office locations. Sea trial: You may also choose to arrange a sea trial at a time convenient for yourself, the Sales Consultant and the current owner. Your Sales Consultant will take care of all necessary arrangements regarding the survey process and the organising of a sea trial. After receiving the results of your survey and the completion of your sea trial you may choose to move forward with the purchase or bring up any concerns with your Sales Consultant. Survey and Sea Trial Costs: All costs regarding the survey, haul in/out are at the expense of the Buyer, unless shared costs are agreed upon. If a skipper is required for sea trial and/or delivery, this would usually be covered by the Seller. All arrangements must be made via the Sales Consultant and agreed by the Seller. At all times the boat will be covered by the Seller’s insurance policy. Repairs: Should it be decided that repairs are required for the boat to meet the standard to which it was advertised, or to meet the conditions of the Purchase Agreement, quotes can be obtained and if the cost of these repairs are agreed by the Buyer and the Seller, rather than hold up the sale it is usually agreed for the sale to continue with the settlement price discounted by the value of the agreed repairs. The Buyer is not authorised to conduct any repairs until they have taken possession of the boat after settlement. All repairs prior to settlement must be authorised in writing by the seller. All negotiations will be handled by the Sales Consultant. Encumbrance check: Prior to settlement our finance team will conduct a Personal Property Securities Register search to ensure clear title can be transferred from the Seller to the Buyer. Signing of Original Bill of Sale documents: Two Bill of Sale Documents will be sent to the Seller for signing prior to the Settlement date, to be available for signing by the Buyer at settlement. These original documents will only be handled by courier and can take some time for transport depending on the Seller and Buyer’s location. After final signing by the Buyer one original will be provided to the Buyer and one to the Seller. Final payment: Transfer of the final settlement amount to Multihull Solutions Trust Account will be required a minimum of 3 business days prior to settlement date/time, however the earlier these funds are transferred the more likely the settlement date can be met. Delays due to funds not being available may incur interest charges and may put you at risk of default. Multihull Solutions will handle the settlement process at the agreed settlement date and time. Multihull Solutions acts as the security for both the Buyer and the Seller during this process, we will ensure documents and funds are held in trust until all parties are satisfied and happy to proceed with settlement. 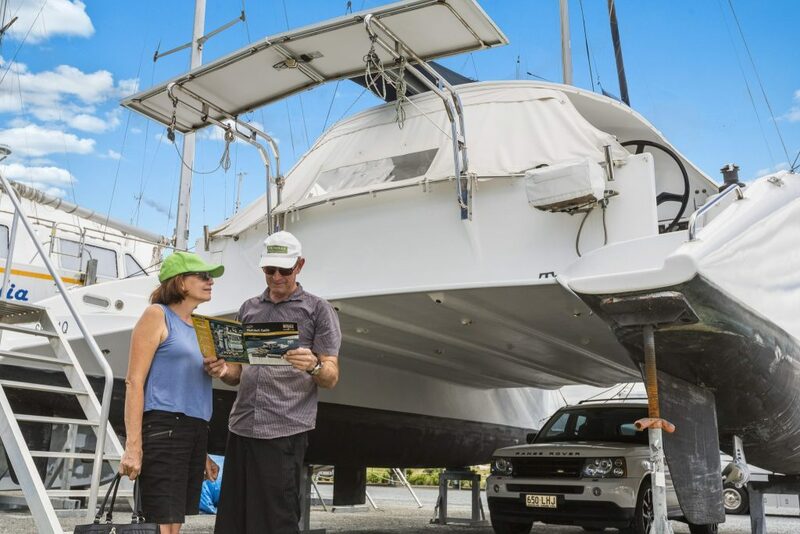 Multihull Solutions is a member of the Boating Industry Association of Australia, the New Zealand Marine Industry Association and the Thailand Marine Business Association and is bound by the applicable industry’s Code of Practice. Bill of Sale Documents: Once the funds have been confirmed as cleared into the Multihull Solutions Trust Account and all documents are signed as required, Multihull Solutions will facilitate the handover of signed original Bill of Sale documents to the Seller and the Buyer. Transfer of Funds: Arrangements will be made for the funds to be transferred from the Multihull Solutions Trust Account to the Seller, this transfer may take several days depending on the banks involved and if the transfers are domestic or overseas. Registration Transfer: The Sales Consultant will assist the Buyer with choosing the registration they require, and our administration team can assist in the registration process. The Buyer can start the registration process at any time however in some cases registration cannot be finalised until the Buyer has an original copy of the final signed Bill of Sale, this will be provided by the Broker at settlement. At this point the Buyer can take the original signed Bill of Sale document to their state registration office to complete the registration process. De-flag certificates: In some cases, a De-flag certificate (de-registration certificate) may be required from the Seller, however the Seller would not usually begin this process until the settlement process has been finalised. Multihull Solutions will arrange for the Seller to get these documents to the Buyer as soon as physically possible and if required by the Buyer, a small portion of the settlement funds may be held by Multihull Solutions in trust until the Buyer is satisfied they have received all required documentation. Please keep in mind, it is in the Sellers best interest to de-register the vessel as this reduces their risk, responsibility and costs. Insurance: In the interest of both parties, we recommend the Seller continues their insurance policy until after the settlement date, and the Buyer should start their insurance policy prior to the settlement date. Multihull Solutions can assist with quotes from the world’s top marine insurance companies. Click here to obtain quotes. If you have any further queries on the buying process, please don’t hesitate to contact us today. Thanks for subscribing to Multihull Solutions e-Newsletter. To complete your subscription, simply click the confirmation link in an email we have sent to the email address you have specified. We will keep you informed on the latest model catamarans and trimarans, best buys on boats for sale, catamaran reviews, articles and promotions. Sign up to our e-newsletter which is packed with information on the latest catamarans and trimarans, best buys on boats for sale, catamaran reviews, articles and promotions.